The best articles with (7) tips are the ones that include an original (7) tips that others have not heard before. ie: Use your brain, experience and history in your niche to come up with the (7) tips instead of regurgitating the same (7) tips everyone else in your niche uses. Do not mention the other tips or your primary article in any of the other articles. ie: Each of your (8) articles in this strategy MUST stand alone. Article marketing is not *article parts friendly* (2). Use a simple Introduction–Tips–Conclusion paragraph approach to help your reader understand your context. Aim for at least 400-500 words for each article. It’s rare when someone can deliver real value in under 400 words … yet avoid the temptation to include filler/bloat words. Sometimes this means writing 100s of words and cutting your article down in size until you’ve found the best way to deliver the message in few words. Did you know EzineArticles expert authors have sent in over 700+ Top7/Top 10 Tips type articles? Check it out. I believe this strategy was first popularized by Jeff Herring. Correct me if I’m wrong. I have a similar method to “write multiple articles in one sitting.” I’ve written about it in one of my articles. Thanks for the tip. Doestn’t matter who’s idea it was first. Sometimes great ideas get buried and you have to help resurface them from time to time. I”m going to give this strategy a try. I think this is a great tip and one I will follow based on our new book to be released in August. I’ve noticed any type of articles with “tips” and or “how to” do better over the long run. Primarily I really like this part in quotes because one can get much more out of a single article. “Step #2: Write an article expanding on each of the (7) tips you gave in the 1st article. This is article #2 through #8”. Now I can go back and find some of my “tips” articles and expound upon them. I’ve been teaching the 7=8 Instant Article Template for a few years as part of my Instant Article Templates, and I think I recall the post you are talking about. I don’t really care who gets credit as long as people Go Use This Stuff! I’ve been using this template since I first heard Jeff teach about it – a LONG time. It’s really a good one – easy to do and easy to create 7 more articles. What a great idea, Chris–I’m surprised I’ve never heard of this (or thought of it!). This will really help me shortcut the long and sometimes arduous process of generating content on a subject as boring as insurance! Thanks for sharing. Your graphic would make the ideal front page for a piece of software that would allow you to go from Tip page to Tip page so that if you wanted to check your content to make sure there were no repeats etc then that would be so simple. Sadly I am not a programmer but there must be a member that could produce a simple program accordingly. Maybe put in a wordcount as well! Chris, I hate to admit this but…I just had one of those ‘duh’ moments in my office reading your article. What great tips that make great sense!! I love writing articles with 7 tips and never thought, not once of expanding to more articles from the original tips. I just moved on to the next article subject. Again, the ‘duh’ comes to mind – but not all is lost. I have some revamping and resurrecting to do of articles past. How terrific! You have the greatest ideas! I was looking for a way to write more and this will do it. Thanks again. Good tip. I am using it to write a 12-part series on SEO for an Australian print magazine but it will also appear online. The first article covers what the next 11 issues will cover and is a free-standing article in its own right as an introduction to the subject. It has sufficient detail to suit a non-technical audience, whereas the rest are technical. Thanks for the information. I have heard of similar writing techniques but this article is very comprehensive and easy to understand. I will expand my brain and come up with some good content in my future articles, blogs. Thanks! Well done EzineArticles.com. I will use this template for a series of articles I have just started. Re. Christopher Phillips comments about software that will allow you to go from tip page to tip page. The capability is already available on Microsoft Word. 1. Just do a link to another document – put the link at the upper right of your 1st page. You can link several documents that way. Or… 2. create a table of contents on the 1st page and do all the articles in the same document – I do it all the time. Use the keyboard shortcut to go to the 1st page and click on the article you are looking for. I also created a keyboard shortcut for the “table of contents” – to save time and avoid using the mouse. Or… Use the “map” with Microsoft Word. This is a really great formula — when Jeff taught me it I got off dead center and started writing articles. I still use it regularly, especially when I start writing about a new segment of my subject area. I’ve been writing articles from the 7 tips list ever since I started on this internet marketing journey. I’ve been listening to Jeff Herring teach this concept for about a year and a half now and every time he talks about it, I have an A-HA about how simple it is and how productive it can be. I like your graphics Chris! How did you do that? The simplicity of the concepts makes me wonder why I am not writing 8 articles every week! Graphics for this blog are created by our marketing team…and this time it was Joanne who created it with Adobe Photoshop. I usually sketch on paper or her whiteboard what I had in mind and after a few iterations, we have a graphic that helps to explain or illustrate a point. Just one more “tip” for this article. Make sure you have a good introduction and ending paragraph please. As an editor, I so hate it when I come across a great How to or Tip article only to be let down because there is no beginning, middle, and end. There is simply a middle. A middle is not enough and if you want to get into some print publications, which my free articles have made, you want to make sure you follow proper magazine standards. Otherwise, great going. I also LOVE the idea of taking each tip and further expanding into separate articles, I do that, too! We were rejecting Top 7 tips type articles for not having an intro or conclusion, but I overturned our internal rules because I didn’t want us to pass up on quality original “Middles” of content. I do fully agree that it’s BETTER to include a simple introduction and conclusion…. especially for your Article Summary because of the important role that plays in email & rss promotion of your content in the EzineArticles system. I like this idea! I do something like it on my blog. Now that I have seen the idea in writing, I will expand what I do and take advantage of the idea for articles. It will give me more to write about. Thanks Chris and Jeff. I also have to give Louella Hext a big thank you for her tip regarding the linking of page together in Microsoft Word. Great tip Louella! This is a super article idea and it makes a lot of sense. Reference the post from Louella…..I have been using MS Word for years and did not know that it was capable of doing that. Well done….and you have gained another admirer in one of the other posts. I would imagine that a lot of other readers will take advantage of your tip as well. I still however think that a simple program based around the main graphic above would be a lot simpler to use with this method and in fact with producing multi articles in general. Oh to be a programmer!….Too late to start now! Further to my posts above I have just come across a great piece of software that is perfect for all authors writing articles, poetry, books, or ebooks. No hype it will definitely be gone tomorrow. No signup or email address needed…just follow the instructions. Another tip…Once you have downloaded the free version and put in the key….Go to the website and download the latest version Liquid Story Binder XE 2.92 that has even more functions! The free registration key is accepted again. I have no financial interest in the site or the program but I think it is a real gem for members of EzineArticles. A lot of you will already be aware of this site but maybe not what is on offer today!! I really like this idea. I am going to send it out ot my list and blog on it. Coming up with new ideas is one problem all of us face and sometimes even stops us from writing at all. Now we should all be able to get 8 articles out of 1. Great! Great tip, Chris and I’ll gladly let my subscribers know about this. When I read your post I immediately thought of ways to use it building on a Top 10 article I have already submitted to EzineArticles.com. Thanks again for your continuing support with article writing. I have also been using your “writing-in-sets” strategy with some success (and applied the principle to creating Squidoo lenses!). I just submitted a cute little poem about all this… seven stuff. Smile. I will start writing one for this client http://www.mercadeoporinternet.com but I will let you know to check it out. I am fairly new to article marketing and have been spending too much time on each of them. This strategy will make me more efficient. The number seven itself seems to attract a lot of attention in and of itself and is perhaps the best number to use for these tips type articles. Good stuff. Very sound, practical advise for getting the most out of your article writing efforts. I am a contributing writer for TheNetworkMarketingMagazine.com Arthur’s Corner, Mighty Monthly Musings. Look me up and leave me a message you were there. Great tips. I like to write “tips” kinda articles. 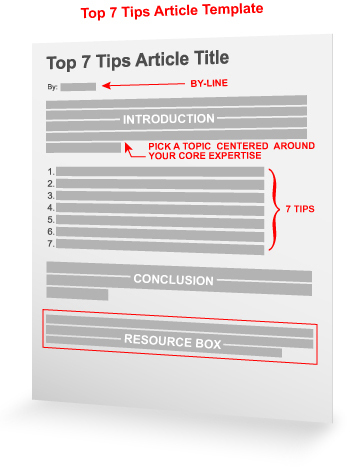 This template will help me a lot to write “top tips” articles. Geat tip thank you for sharing. Thanks for that tip. I am a total newbie to article marketing and I like the simplicity of this strategy. I am going to get to work on it right away! Thanks again. Excellent Idea! I normally do the opposite when I write Articles on Revenue Sharing Sites. I write a minimum 10 plus stand alone articles and then summarize the entire series and provide links to the stand alone articles on what I call a Master Article. I normally do not write on any topic where I cannot write a minimum 10 articles. Here I am in the middle of the night – a writer – and feeling incredibly unremarkable. Then in pops this email with a wonderfully simple strategy and I am lifted out of my ennui. A couple of things to share: Seven tips is a great way to get people to sign onto your site – as long as they are original – as mentioned – and relevant. If you have an auto-responder they can go out to new subscribers automatically – one a day or week – whatever interval you wish. The number seven is perfect for building rapport as, psychologically, it takes seven encounters or interactions to gain trust. Once you have sent out your seven daily or weekly tips of value (these would be the long version – 400 to 500 words), you will have followers who feel they know you and have gained from your expertise. They will be more likely to open subsequent emails – or even look forward to them! I agree wholeheartedly with write more and edit down. That way the articles are meaty and not fluffy – something that will increase or decrease trust in you as an expert. Great tips. Having an article template really helps a lot in writing articles. This is such a great tip. This strategy will be very helpful to speed up the process of writing articles. Thanks Chris for such a wonderful piece of information. I would certainly try this one out very soon. Sounds simple yet effective. This ideas has never crossed my mind and due to how beneficial it is i don’t care where it originate from. Great article which opens a lot of possibilities. I believe i can think of several subject matters to use this system.